But knowing that I would be in a movie theater for a little over two hours, I knew I’d need a knitting project that would be “blind” while making something useful. 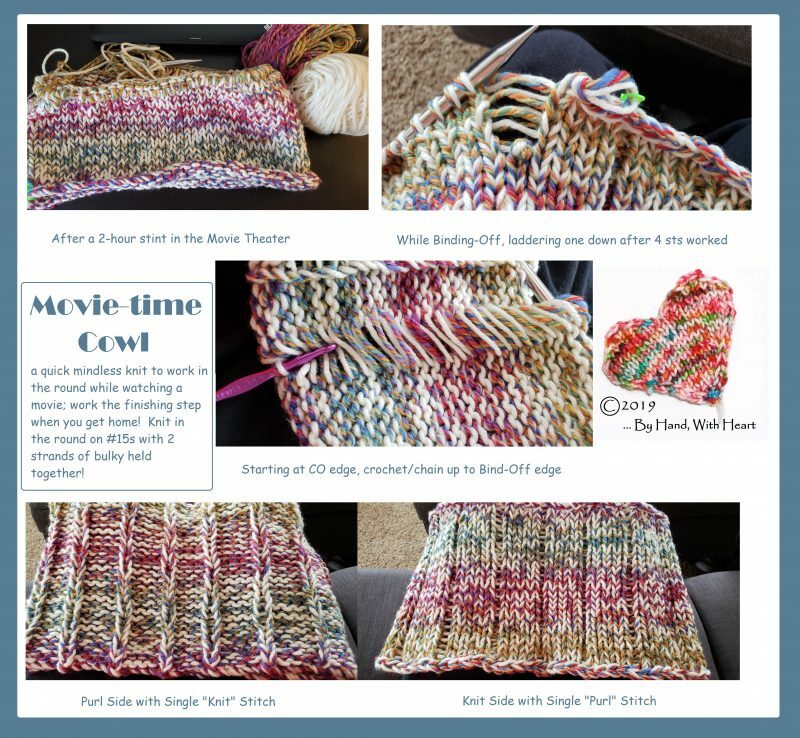 Movie-Time Cowl – so easy you can make most of it while watching a movie! Using two strands of bulky weight yarn, size US #15 circs, this is a quick and fun knit and makes a wonderfully cozy cowl that ends up at 30-inches around by 9-inches high. The directions are here if you’d like to try your own. I literally did the bulk of the knitting while in the theater: knitting in the round in the dark is easy-schmeasy. When I got home, I then did about an hour’s worth of work to bind-off while laddering-down-hooking back up after every 4 stitches. 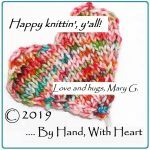 Not only do I love the look of the “k stitch on the purl side” because it breaks up the pooling from the multi-colored yarn but the cowl actually lies flat thanks to this stitch. Remember, stockinette, while lovely and smooth on the knit side, will curl top and bottom. That’s a fact and you can’t change that (which is why most pieces will have rib or some such at the bottom and top … as well as (for a flat piece of knitting) side borders. You can see in the “2-hours in a theater” picture (upper left) how the hem of the cowl is curling, even before it’s taken off the needles. In the two bottom pictures, the hem lies flat.